This piece is a bit of real art for a change. 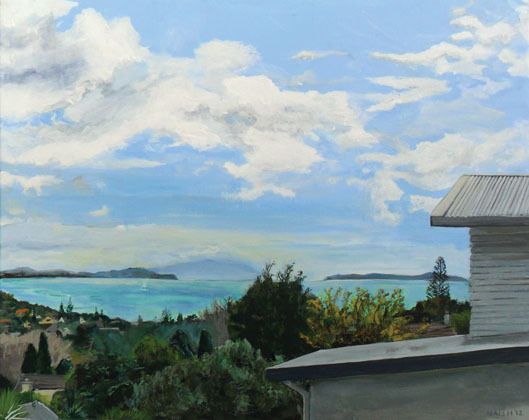 I painted this in front of the scene itself, while at my parent-in law’s home on the North Shore, Auckland, New Zealand. The view was from their veranda (the ‘deck’) on the roof of a car-port which was open on three sides to the garden and surroundings. When it got too windy, I took refuge in the adjacent conservatory structure, which was also the access point. The conservatory also meant that I could sit outside while having the easel and paints inside. At times I sat inside too, when it was particularly cold or windy though this affected the angle of the view was. I did this work over the course of about four to five days, with quite friendly hours. Luckily the final day showed a return of the brightness that I had witnessed in the first day; which was invaluable to help finish off some of the warmer colours. The sky was a combination of two days- but I don’t think it looks odd. The side building went through several versions; indeed the evening view had a distinct slanted shadow across the slat work; while the chosen morning view was more diffuse and darker overall. Studying the view made me understand how different the fauna was compared to the UK. Also when subsequently driving around the area I’d spot the same type of trees, or indeed the exact tree I’d been painting but from a closer viewpoint. The volcano in the far distance actually went awol in the view on the final day, but I wasn’t going to give that up. Overall I was worried the view was a little bland, but I feel the pleasant day aspect ultimately gives it enough interest.